If you read my blog much, you know that I am an active member of the Wayne Country Gem and Mineral Club of western New York State and that I edit the club newsletter. You may even know the club motto: WCGMC is always looking for new places to dig. Well, this fall we ventured in New England on two occasions looking for new opportunities to include in our 2018 field trip season. In mid- September, two of us scouted out four sites in western Massachusetts and came back happy to report that several of them could form the basis of a trip to that region. In mid-October several of us plan a similar trip to visit several sites in western Connecticut. Later this fall or winter I’ll probably summarize that trip. Without a doubt, the highlight of the Massachusetts trip was collecting rhodonite at the Betts Manganese Mine in Plainfield, MA. Rhodonite is the Official State Gemstone of Massachusetts and after a few hours hunting in the dumps it was easy to see why. After the location’s Minerals Coordinator, Rick Cernak, showed us the two quarries on the property and the location of the dumps, we set to work pounding and breaking rocks covered by dark black dirty manganese oxide. 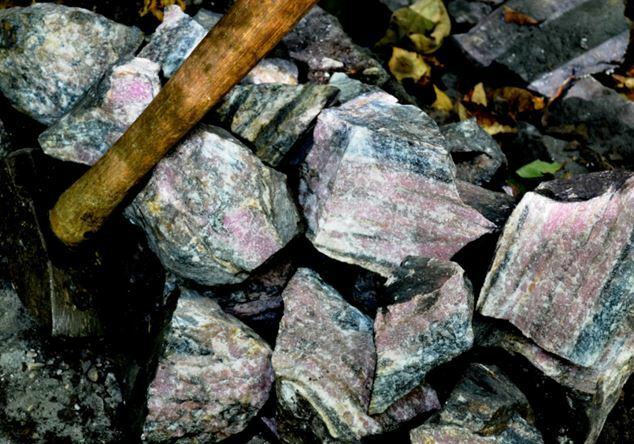 Most of the black rocks yielded the host rock, schist, or rocks loaded with magnetite and sometimes carbonate, including tan or pale pink rhodochrosite. There is also spessartine garnet, typically as small crystals or as massive light orange-red rock. 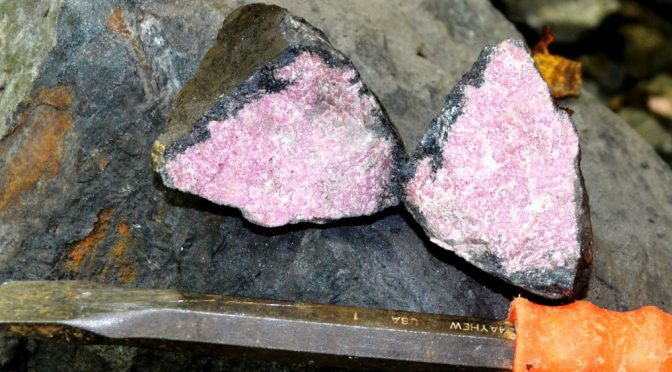 But on occasion the brown-black oxide coated rock broke to expose the beautiful pink color of massive rhodonite (see featured photo above) or a layered rock featuring rhodonite with magnetite (see photo below). Come see some in person at the next club meeting. We will both be cutting and polishing at the next workshop. We also visited the Barrus Farm pegmatite in Goshen with Rick Cernak. The prize there would be goshenite, a colorless form of beryl which is actually named for the location. While that is apparently somewhat uncommon and also hard to distinguish from quartz, dark blue elbaite tourmaline set into white quartz/feldspar/muscovite is abundant. Some of the muscovite is yellow-green, some is even pink. And the list of minerals from the site is actually rather long (see Mindat posting). Both the Betts Mine and the Barrus pegmatite are fee sites on private property that can only be visited by clubs and only by pre-arrangement, which is exactly what WCGMC just might try to do some fine spring weekend in 2018. Yup, that is me, pounding on black rocks to expose brilliant pink rhodonite. The yellow arrow points to a piece that made its way to the pile in the second photo. I may have been thinking of the 1973 Australian stamp as I pecked away. OK, maybe I wasn’t, but it sounds good! This photo of layered rhodonite on the forest floor does not show the color well. It is very pink. 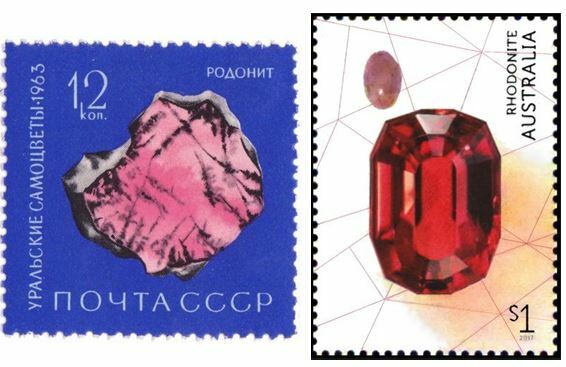 Australia is not the only country to have issued a stamp featuring pink lapidary quality rhodonite. In 1963, Russia did likewise. 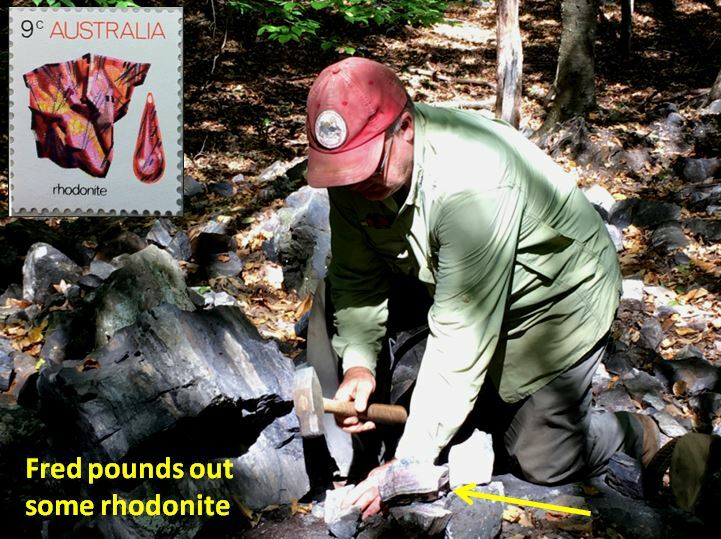 Of course, gem quality rhodonite is also found and Australia featured a fine rhodonite gemstone on a new stamp issue just a few months ago. On this trip, we also visited the Manhan Lead Mine dumps in Loudville, MA and the lower mine dump areas of the Chester Emery Mines. The former is the oldest lead mine in America. Discovered in 1679, the site actually predates the American Revolution by nearly a century. Lots of quartz there, some galena, and some interesting boxwork where sulfide minerals had once resided, but we found only one example of the deep green pyromorphite for which the location is known. I believe I will write more on this neat site in the near future.